In the process of attaining an experience of Simple Reality what is the significance of “right view” (which is one of the precepts in the Buddha’s Eightfold Path)? “While belief per se tends not to be a central concern for Buddhists, how we see the world—what is sometimes known as ‘the view’—is. How we see the world determines how we will act within it.’” That explanation by Barry Boyce is a good starting point for this article because changing our behavior is all-important. The capacity to discern the true nature of a situation, to penetrate to the essence, to the reality of our experience, is empowered by a profound perspective, by a “right view.” To wake up we must become observers of our own personal experience. Through that process of observation, we will gain profound “insights” into the nature of reality. These “breakthroughs” are at the heart of shifting from the relative to the Absolute and the attainment of what the Buddha called “right view.” Through right view we arrive into the present moment, the Now. We arrive at the place that we never left and experience it for the first time. The consequences of experiencing life from the perspective of an illusory paradigm, as most of us know, results in a life of suffering and is “the experience [that] confused beings develop as a result of unawareness, and instead of the five modes of knowledge, the five poisons, or emotional afflictions, arise. The dualistic sense of self and other is born, and the illusory self gradually perceives the external world as filled with the objects of its desire, hatred, pride, envy and delusion. In this way, existence in the six realms of samsara [suffering] comes about, entirely based on mistaken perception.” In the language of Buddhism, Francesca Freemantle has expressed very clearly the importance of right view. Right view can also come as a sudden insight, as a spontaneous paradigm shift. Buddha spoke of right view “with taints” and right view “without taints.” The Hindu Bhagavata Purana VI describes those two states. “Soon his mind was illumined, and he had the vision of the God of Love. He felt overwhelming joy in his heart, and attained peace and tranquility. As he continued his practices there came greater and greater illumination, and he ultimately realized his unity with Brahman.” So must we also “continue our practice,” insight or no insight, gradually reducing our ratio of reactions to responses by means of the Point of Power Practice. “You get what you concentrate upon.” And what we must concentrate upon is Simple Reality. The first set of obstacles is cognitive or intellectual in nature, what could be called core beliefs. A paradigm shift involving the attainment of right view will change our fundamental understanding of these “taints.” Then we must employ the Point of Power Practice to work on the deeper conditioning and over time we will arrive at the insight “free from taints” or reactions. 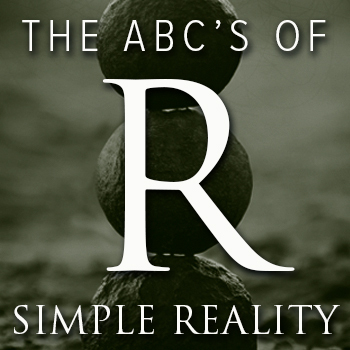 As we have said many times, the principles of Simple Reality must be repeated over and over again because we are involved in reconditioning our deeply ingrained behavior patterns. So we have established that what is needed then is a paradigm shift. The reason we need a paradigm shift is that most other attempts to address human suffering address only symptoms and not the causes. Without a paradigm shift, we are wasting our time although it may seem otherwise. For example, the widow of MLK Jr., Coretta Scott King, laments that: “One of the failings of the [Civil Rights] Movement was that, while we taught people to fight against the system, and how to respect themselves, we didn’t teach young people that they would have to fight all over again.” So without a paradigm shift, without a change to right view, we cannot make lasting or profound change. As we have learned in other articles in this encyclopedia, a paradigm shift will drive a shift in identity. The following quote from the Zen practitioner Master Sheng–Yen describes an intellectual understanding of why a new identity is created by a shift in worldview. “The second way to transcend the ego is the conceptual way. It happens when there’s a sudden and complete change in one’s viewpoint. It can happen for example, when one’s reading a sutra or listening to a dharma talk. In an instant, one can become enlightened. But for this to really work, a person has to already want to know the answer to the question, ‘What is the ego, what is the self?’” It is also effective to forget about the ego and learn what the true self is not. The true self is not the body, mind or emotions. Edward Edinger reminds us that all profound human wisdom such as right view inevitably shows up in our mythology. “History and anthropology teach us that a human society cannot long survive unless its members are psychologically contained within a central living myth. Such a myth provides the individual with a reason for being. To the ultimate questions [The Three Great Questions] of human existence it provides answers which satisfy the most developed and discriminating members of the society. And if the creative, intellectual minority is in harmony with the prevailing myth, the other layers of society will follow its lead and may even be spared a direct encounter with the fateful question of the meaning of life.” However that myth or story must be a profound one to enable humanity to cope with self-created suffering. Edinger continues: “It is evident to thoughtful people that Western society no longer has a viable, functioning myth. Indeed, all the major world cultures are approaching, to a greater or lesser extent, the state of mythlessness. The breakdown of a central myth is like the shattering of a vessel containing a precious essence; the fluid is spilled and drains away, soaked up by the surrounding undifferentiated matter. Meaning is lost. In its place, primitive and atavistic contents are reactivated. [Atavistic means the reappearance of characteristics in an organism after several generations of absence.] Differentiated values disappear and are replaced by the elemental motivations of power and pleasure, or else the individual is exposed to emptiness and despair. With the loss of awareness of a transpersonal reality (God), the inner and outer anarchies of competing personal desires take over.” In secular terms the transpersonal reality is Simple Reality and, of course, “competing personal desires” are the energy centers of the false self. Religion and right view are not incompatible if one’s religion is held in the context of Simple Reality. “When you are aware of the existence of the entity [Self] and of the soul, you can consciously draw upon their greater energy, understanding and strength.” Seth continues: “It is inherently available, but your conscious intent brings about certain changes in you that automatically trigger such benefits. The results will be felt down to the smallest cells within your body, and will affect even the most seemingly mundane events of your daily life.” Religious mystics will find that right view and religion can be mutually reinforcing. “Although Jung specifically states that he addresses those for whom God is dead, he also points out that the archetypal theme of the death of God is a part of the Christian myth. ‘Christ himself is the typical dying and self-transforming God.’ Christ died but he was not to be found in his tomb. ‘Why seek ye the living among the dead? He is not here; he has risen.’ Luke 24:5” We will not find our Christ Consciousness [intuition] within the tomb (P-B). Buddha taught that we must have “the correct view [and that it] is so important to go beyond conceptual understanding to the direct realization [insight] of the absolute, awakened state.” We will know when we have attained the Absolute, awakened state when our life has become a meditation and Simple Reality is the context for our life.